We’ve had Sophie since she was a kitten. She’s never been allowed outdoors, and shows absolutely no interest in going out. Maybe because there are fewer gullible humans to cuddle with than inside our house. 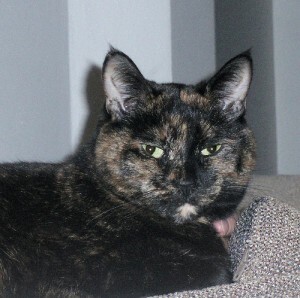 Juniper was a stray we got as an adult, and has been harder to keep away from the doors. We have a boatload of toys for her, so we’re all well entertained. 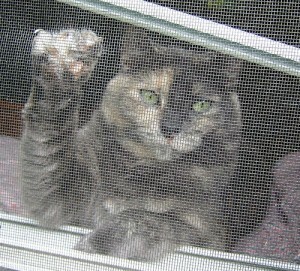 She finally gets the point she can’t go out; we’re still working on the concept of window screens. Funny. First time to your site and it’s on a topic I’m VERY into. Conservation biologist with 2 cats who are indoors, thank you very much. =) It’s amazing to me how people who are wildlife biologists can have indoor/outdoor cats. Really? Millions of lizards, birds, bugs, mice, every year. GREAT to hear you advocate this approach to kitty happiness and health and long life.